I’d planned to write about Convict 13 a couple of times before this. It’s a long-time backup choice for me: something short and quick, a film I could watch in a busy week, late at night, in a state of fatigue, when I just, really, needed, new content for the blog. This week was that week. Convict 13 was never my favourite Buster Keaton short; not even close. By the standards of his later shorts, especially The Playhouse and Cops, it’s crude; a succession, mostly, of vaudeville gags Keaton brought from stage to screen. Compared even to his earlier shorts, One Week and The High Sign, it is uninspired. But one thing about Convict 13 has always, always impressed me: its incredible violence. We’ll get there in a minute. First, let’s chat a bit about Convict 13’s more traditional Keaton-esque qualities. 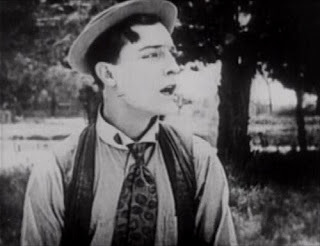 You can see here, even in 1920, the Keaton character already well-formed. The film opens with him on a golf-course, swinging without skill, while a crowd of wealthy onlookers laughs at him. He launches a ball into a water hazard; then floats into the middle of it on piece of wood, scooping up fish with his hands in hope of finding the one that swallowed his ball. He does, then paddles back to shore using his club. Most people would have taken the stroke. Here, as in most of his silent work, Keaton plays an obsessive man with limited perspective—one who pours tremendous energy and creativity into achieving a goal, but gives little thought to the worthiness of that goal in the grander scheme. The less tenable a situation becomes, the harder he tries, and from this comes the jokes. 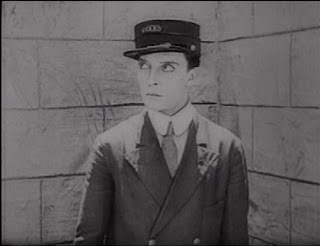 The character in Convict 13 will reach his logical conclusion in Johnny Grey: Keaton’s Civil War train conductor who spends half of The General chasing a train and the other half escaping one. (The General may also be Keaton’s attempt at self-parody. The train-chase actually is limited: one train following another on a single piece of track. It’s the one time Keaton’s quest really is as prescribed as he thinks it is. He solves the problems of the chase imaginatively and unpredictably, as always, but in this case, he’s responding to a real need, not one created by his fixations. His actions are strategic, even heroic; whereas normally, they’re futile and pathetic. Viewed this way, The General seems far less cynical than most of Keaton’s work.) Now back to the subject at hand. Keaton knocks himself out. He’s discovered, prone, by an escaped con of approximately equal stature, who switches their clothes and runs off. Keaton comes to, fails to notice the wardrobe change (there’s that tunnel-vision again) and returns to his golf-game. He’s happened upon by two policemen, then by several more, who give chase in a sequence Keaton later reworked—and greatly expanded—in Cops. He escapes them by bolting into a gated compound and locking himself in. This is, of course, the prison. I’ve always considered this gag atypical of Keaton’s work, because it is rooted in absurdity (convicts enjoying the execution of one of their own, even treating it as a spectator sport), while Keaton’s comedy, as a rule, begins with what’s sensible, then spirals off. What follows is stranger yet. We’re introduced to another prisoner—a huge, imposing man played by Keaton stock-heavy Joe Roberts—crushing rocks while a guard pokes him in the back with his rifle. Fed up, Roberts hits him with a sledgehammer. Hard. He grabs another guard by the feet, whirling him around and around (in pro wrestling, that’s called a Giant Swing) and releasing him head-first into the prison wall. Then he advances on the fallen guard, and beats his skull against the dirt. Roberts manages to KO nearly every other guard in the joint by hitting them, one at a time, as they emerge from a doorway. The men collapse like dolls. It’s all very Keystone, but not very Keaton. Our hero, meanwhile, has managed to switch his prison stripes for the uniform of a fallen guard—which seemed like a good idea until Roberts caught sight of him. He manages to capture Roberts anyway, and earns the title of assistant warden from his apparently near-sighted boss. Convict 13 now cuts, suddenly, to some point in the future (really it could be weeks or months later), with Roberts planning another riot. This time it’s a gunfight, and a pretty serious one; prisoners obtain their own rifles and shoot the guards—not in the bum, but in the chest. One of them twitches when he hits the ground. Keaton saves the day one more time: in the probably the film’s most famous scene, he attaches a speed-bag to a length of rope, then swings it in circles (think of a lasso with a weighted end), clocking the prisoners one by one. The riot is quashed and Keaton’s girl (Sybil Seely: also his girl in One Week, The Boat, The Scarecrow, and The Frozen North) is saved. 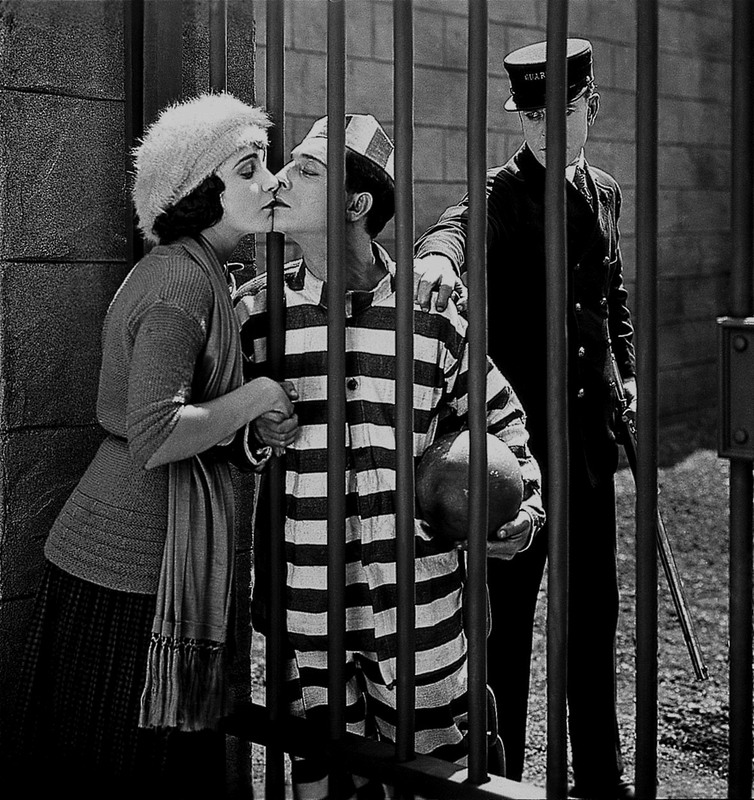 For a Keaton film, even an early one, Convict 13 hangs loosely. It’s more a collection of ideas than a whole; both a harbinger of Keaton’s better, future work and an artistic dead-end. It is cynical the way most Keaton-films would be: placing a simplistic, but decent man in a world that seemingly exists to mock him. Convict 13, like Cops, The General, even Sherlock, Jr., questions whether a man’s talent, intentions or character matter half so much in life as the uniform he wears—a theme picked up by dramatic filmmakers like F.W. Murnau as well. But the unbelievable violence of this short, which has no real equivalent in Keaton’s work, suggests a direction Keaton could have gone, but decided, wisely, to avoid. Knockabout comedy has its place, and it can be great, but it doesn’t need a character with Keaton’s depth to make it work. And we need Keaton’s little hero a heck of a lot more than a punch in the face. Kino International’s DVD release of Steamboat Bill, Jr. (1928) includes both Convict 13 and the surviving footage of Keaton’s 1922 short, Daydreams.